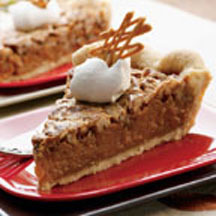 Your holiday table will look wonderful with this delicious butterscotch pecan pie. Melt 1 1/3 cups morsels in medium, uncovered microwave-safe bowl on MEDIUM-HIGH (70%) power for 1 minute; STIR. Morsels may retain some of their shape. If necessary, microwave at additional 10 to 15-second intervals, stirring just until morsels are melted. To Garnish and Serve: Line baking sheet with wax paper. Place remaining morsels in heavy-duty plastic bag. Microwave on MEDIUM-HIGH (70%) power for 30 to 45 seconds; knead. Microwave at 10 to 15-second intervals, kneading until smooth. Cut tiny corner from bag. Drizzle 10 circular designs about 2 inches high and wide onto prepared baking sheet. Refrigerate for 5 to 10 minutes or until firm. 1/3 cup NESTLÉ® TOLL HOUSE® Semi-Sweet Chocolate Morsels can also be melted and made into drizzle designs instead of the Butterscotch Flavored Morsels. Two shallow (2-cup volume) pie shells can be substituted for the one deep-dish pie shell. Follow directions above and bake for 30 to 35 minutes.